Whether you are a first-time meditator or an active Buddhist practitioner, Gaden Samten Ling Tibetan Buddhist Meditation Society offers a warm and welcoming environment in which to practise. 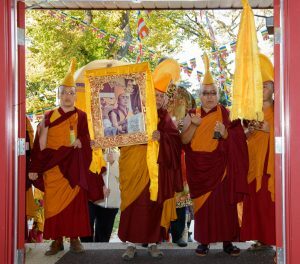 Our Society is based in the Alberta Centre for Peace and Meditation in Edmonton, Alberta, Canada, built in 2012 in the style of a Tibetan monastery. Our Society is a non-profit, volunteer-driven organization, incorporated in 1991 under Alberta's Societies Act (click here for Governance). We are also a registered charity. Throughout its history, our Society has maintained a strong bond with our root guru His Holiness the 14th Dalai Lama. We are dedicated to uphold, disseminate, and teach Tibetan Buddhist philosophy, and practice, in particular the Gaden Tripa tradition of the Geulgpa lineage. 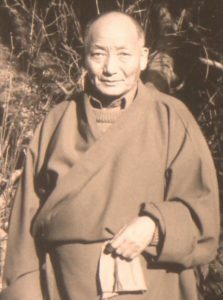 Our Society was founded by Geshe Ngawang Kaldan in 1991. Since 2000 it has been under the spiritual direction of Kushok Lobsang Dhamchöe. Kushok was born in Tibet, escaped to India in 1963, and studied for 30 years at Namgyal Monastery in India, the personal non-sectarian monastery of His Holiness the Dalai Lama. Our Society is very active. Join us for meditation and Buddhist philosophy courses and retreats, Vajrayana practices, and Tibetan Cultural activities and Dharma festivals. Be part of things by volunteering or becoming a member (click here for Membership). These days, in the West, people are very interested in meditation. Through meditation you can change your inner self, your inner mind. This in turn prepares you to handle whatever you face in the outer world. As His Holiness the 14th Dalai Lama says ‘Be wisely selfish’. By cherishing others more than yourself, you will eventually benefit yourself. This is how you learn to develop the altruistic mind, which is the source of all knowledge and happiness that we wish for ourselves. My hope is that all people in the world practise bodhicitta so that the happiness and success they wish for can be achieved.